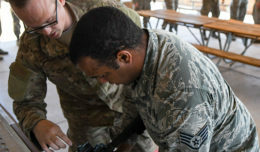 Air Force cyber security technicians with the 355th Communications Squadron review work orders at Davis-Monthan Air Force Base. 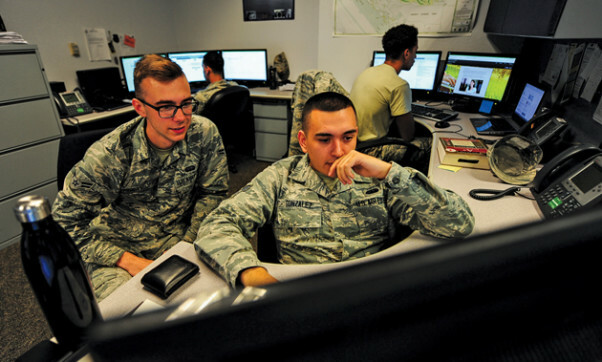 Cyber security technicians are tasked with safeguarding operational and communications security for installation computer and phone systems. As a result of sensitive information being distributed digitally, cyber-attacks have become more prevalent as technology progresses. These attacks can wreak havoc on mediums ranging from personal cell phones to complex government networks. 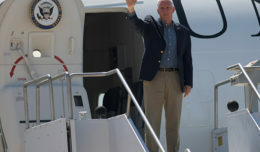 “When it comes to information security, we monitor the Non-secure Internet Protocol Router Network and the Secret Internet Protocol Router Network enclaves throughout the base,” said Master Sgt. Daniel Elliot, 355th Wing cyber security COMSEC account manager. If someone sends information out through NIPRNet that could be a leak of operational security, Cyber Security is contacted as soon as possible. 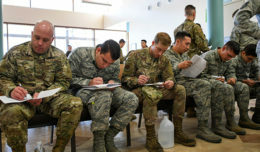 From there, the problem is quarantined by finding the workstations involved in the incident and restricting their network access until the issue can be resolved, explained Senior Airman Jason Crutchfield, 355th Wing cyber security technician. “We make sure that we properly destroy things, like hard drives, in order to eliminate the risk of any possible information leaks,” said Airman 1st Class Damacius Williams, 355th CS cyber security technician.